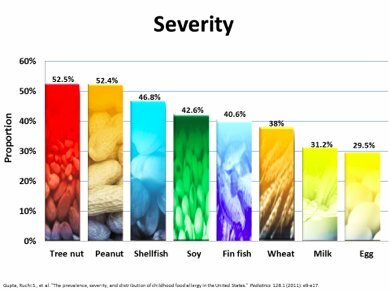 When we think about severe food allergy, most of us would think about nut allergy, which is one of the most common food allergies and appears to be on the increase. Recent studies looking at peanut allergy show that the rate of peanut allergy has doubled over a 5 year period both here, in Europe and in the United States. Peanut allergy is estimated now to affect 1 in 50 young infants, and tree nut allergy also seems more common. When food allergy features in the news, many stories commonly relate to nuts. They may be reporting on people who have experienced severe allergic reactions or be related to the results of research. In recent years big exciting studies have been published particularly in peanut allergy. In this blog post, we give an overview of nut allergy as well as where the results of some of the research come in. “Nuts” is an umbrella term that refers to a group of different foods, including peanuts and tree nuts. Peanuts are groundnuts and are actually part of the legume family. People with peanut allergy can sometimes be allergic to other legumes, such as soya, chickpeas, lentils, beans and lupin, but this is not common. It is more common to also be allergic to tree nuts such as almond, brazil nuts, cashews, hazelnuts, macadamia, pecans, pistachios, and walnuts. It is possible to be allergic to just one type of tree nut, but it is also common to be allergic to multiple different types. Some nuts are closely related, for example someone who is allergic to cashew nuts will usually also be allergic to pistachios, and similarly, walnut and pecan. One in four people with a nut allergy are allergic to sesame seeds. Another form of nut allergy is related to hay fever. Some people with an allergy to pollen (usually birch tree) develop symptoms in their mouth (itching and swelling) when they eat raw fruit or nuts such as almonds, hazelnuts and peanuts. This is often thought of as a mild allergy, but severe reactions can occur in the minority, particularly if large amounts of the food are eaten. We talked about this previously in relation to soya allergy. It is important that if you have an allergy too peanut or tree nuts you receive individual advice from a healthcare professional. This should be in relation to the specific nuts to avoid or include. As well as nuts having many nutritional benefits, recent research has shown us that if foods are tolerated then they should be included in the diet regularly to maintain this tolerance. This is especially important for foods such as nuts. Studies such as LEAP and EAT provide evidence that if peanut is introduced early in life then this may prevent peanut allergy developing. You should get individual advice from your doctor about introducing peanut into your child’s diet when weaning from 4-11 months, rather than avoiding or waiting. We will have a separate blog devoted to the LEAP study, its implications for weaning and how to find the right nut-containing foods for your infant to come. The degree of caution required with cross-contamination will also depend on the individual allergy. Many foods are labelled as “may contain nuts” and your doctor or dietitian is best placed to advise you about how to interpret and apply these statements. Although all tree nuts and peanuts need to be emphasised on food labels under EU law, the precautionary statements are still voluntary and not legal requirements. As well as being able to set up your profile on FoodMaestro to avoid all or specific nuts, you can set it to avoid or include foods that “may contain” nuts. One additional feature is that users and health professionals can add notes to products, for instance if there is a likely risk of contamination or if a high risk product is known to be safe. If you or your child have nut allergy, then speak to your GP, dietitian or hospital Consultant for individual advice.